Bloomington St. Mary High School "Fighting Irish"
Courtesy of Don Raycraft's "Living Legends" A Photographic History of McLean County Sports"
Bloomington (population 74,975) is located in the central part of the state of Illinois in McLean County, being a hub to much of the state. Interstates 39, 55, & 74 go around Bloomington and its' adjoining neighbor, Normal, along with US Routes 51 and 150 and Illinois 9. The Chicago & Alton Railroad also has a line that runs thru Bloomington, and served as a significant employer during its heyday. Route 66 was also a part of the community while it was in operation, but it is not forgotten as you can still travel parts of the "Main Street of America" today. The community was established in 1830, as early pioneers such as James Allin and Jesse Fell helped get it up and running. The county is named for John McLean, a pioneer lawyer, territorial judge, the first Representative in Congress from Illinois (1818), and United States Senator (1824–25), while Bloomington was given its name originally as Blooming Grove when settled around 1822, slightly changing the name to its current moniker when the county was formed in 1830. Outside of Abraham Lincoln's presence in the community, others such as David Davis (a former Supreme Court Justice), baseball Hall of Fame pitcher Charles "Hoss" Radbourn, naturalist John Wesley Powell, politican Adlai Stevenson I and his son Adlai II, and actor McLean Stevenson (a cousin to Adlai II) are well-known figures who lived in Bloomington at one time. Nineteenth Century opera singer Marie Litta (aka Jenny Lind) also hailed from Bloomington as well. Bloomington is home to Illinois Wesleyan University, which opened in 1850, and the nation's number one auto and property/casualty insurance companies, State Farm Insurance. The state's oldest public university, Illinois State University (founded in 1857) is also nearby in Normal, along with Mitsubishi Motors North America. Education began to be offered in Bloomington in the 1840's and private/parochial schools followed suit with a boys’ school in 1858 and St. Joseph Academy for girls in 1863. St. Mary's School was opened as a grade school in 1884 by Rev. Michael Weldon, adding high school classes at a later date. The first graduates of St. Mary's came in 1898, which became a tradition every year thru 1928 when a new building was opened across the street from St. Mary's and changed its name to Trinity in honor of the name of the Catholic Church located near the former St. Mary's. The new building was also a welcome site for the Holy Trinity family, since the St. Mary building was cramped by holding twelve grades. The name was changed again to Central Catholic in 1967 when the Catholic Diocese of Peoria requested that Epiphany Parish of Normal and St. Patrick's Parish of Merna join Trinity, St. Mary's, and Historical St. Patrick's parishes in Bloomington in governing and subsidizing Catholic high school education in Bloomington-Normal. The old St. Mary's building was renovated after the high school students moved into their new building, serving as a grade school for a number of years. The fate of the building is an unfortunate one, having been demolished in 1969 and its land today is used as a parking lot for Holy Trinity Catholic Church. Name of yearbook: the "Trinitas"
Saint Mary's, Mater, hail to thee! St. Mary's offered baseball, basketball, and football while it was open prior to changing its name to Trinity. The school added these sports prior to the name change in the hope that it would bring interest to the school and help boost enrollment. The school offered a very competitive hoops program from the time it started playing the game against other schools in Central Illinois. It won two state Catholic tournaments and went on to play in the National Catholic Invitational Basketball Tournament in Chicago under coach Charley Bennett. The Fighting Irish started out successful right out of the box when the pastor of Holy Trinity Church, Rev. Stephen Moore, requested that Rev. J. P. (Pat) Farrell be assigned to him as an assistant after the previous assistant was transferred by Bishop Edmund Dunne of Peoria to another position. Rev. Farrell was a pitcher in the old Three-I (Indiana, Illinois, & Iowa) League and the program was started upon his arrival. St. Mary’s began a winning tradition that would stretch into a mark of 50-3 over five years, including 38 straight after the school’s name change. Courtesy of Rt. Rev. Msgr. 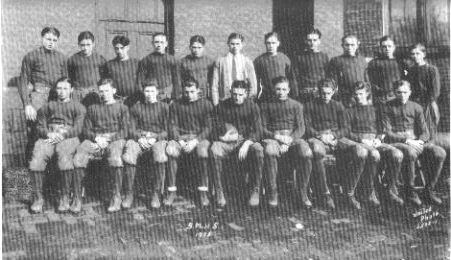 Stephen Moore's book "History of Holy Trinity Parish, Bloomington, IL"
St. Mary offered football as far back as 1925, according to accounts in the Bloomington Pantagraph, and it continued at Trinity as well as at Central Catholic. The first varsity team was a winner, and the program took off from there. Around 1991, Central Catholic decided to honor athletes and coaches alike throughout the history of St. Mary's and Trinity as well as Central Catholic with a Saints' Hall of Fame. Two persons have been inducted from St. Mary's, which are listed below. --Rev. J.P. Farrell (coach & athletic director), 1927-34. --Ken Clothier (class of 1927), starter in football & basketball. In compiling some of the information you see on this page, our thanks go to Trinity graduate JoAnn McGraw (class of 1962, currently in the Office of Development, Public Relations, and Alumni at Bloomington Central Catholic HS) along with Central Catholic yearbook advisor Jim Reckard for giving us some of their time to peruse and compile information from yearbooks of St. Mary's from 1927 & 1928.